Our First Garden: We've Made Progress! Wow, here it is May 28th and I'm just now making my first blog post of the month! Eeek! Life has been crazy, but I'm back in Saint Olaf and I promise to catch everyone up to speed. I've promised posts of photos, art, and North Carolina adventures... don't worry; they really are "coming soon!" For now, I must share with you the exciting happenings of our first garden! For starters, Kate and I went to purchase seeds before I left for NC last month. I felt bad thinking I'd be gone during the planting season (end of April/ much of May). I figured that the preparations of the garden would be the hardest part, right? Luckily a connection was made through one of my new church friends to help us till up the space for our garden. Thanks, Cindy! Whew... at least Kate wouldn't be tilling the garden by herself while I was gone. The garden was tilled the day I flew back to NC. I didn't get to watch the process, but fortunately Zach was able to send me a few photos! :) I never knew I'd be so excited over a few photos of freshly tilled rich black dirt. The weather in Iowa stayed fairly cold while I was gone. 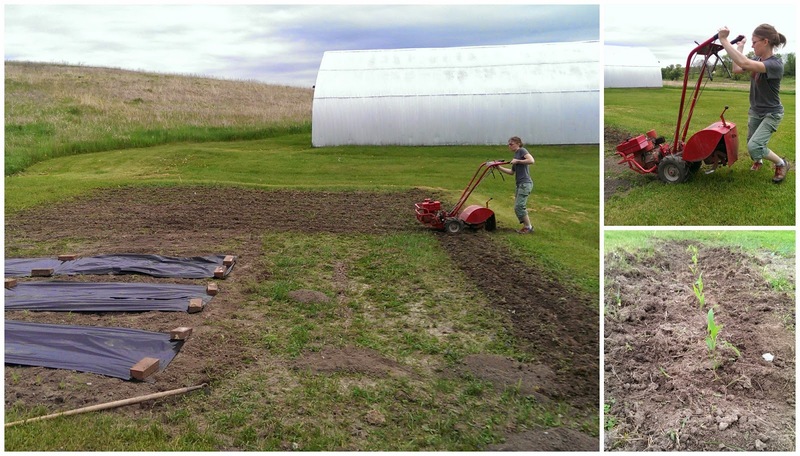 Knowing we could probably wait to plant the majority of our seeds, Kate went ahead and planted five rows of sweet corn. She used a hoe and tilled up rows by hand for our corn. We decided the rest could wait until I returned home. By the time I got back to the farm, grass and weeds had crept into our garden and the dirt had packed down with the rain. Mmmmm... what to do next? Till, rake, hoe, plant & pray? To be completely honest, I hadn't done much research on gardening and thought I'd adopt the "wing-it" approach. The more I talked to people about gardening, the more questions I began to have and the realization that our garden may only produce weeds set in. As time got closer to plant, I began to wonder if this was really going to happen! Rather than throwing in the towel on our gardening dreams, I took it upon myself to visit a few of our neighbors' gardens. I was pleasantly surprised to see such a variety of gardening styles and to learn tons of gardening tips. Who knew there would be so much to learn? I returned to the farm after each garden visit more confident that we would experiment and have fun in our garden. For the past two mornings, Kate came over and we made some serious progress! Yesterday we started in the lower garden. We decided to plant our squash and watermelon in this long narrow garden. Without any maintenance, our garden had packed down and grass had begun to grow. 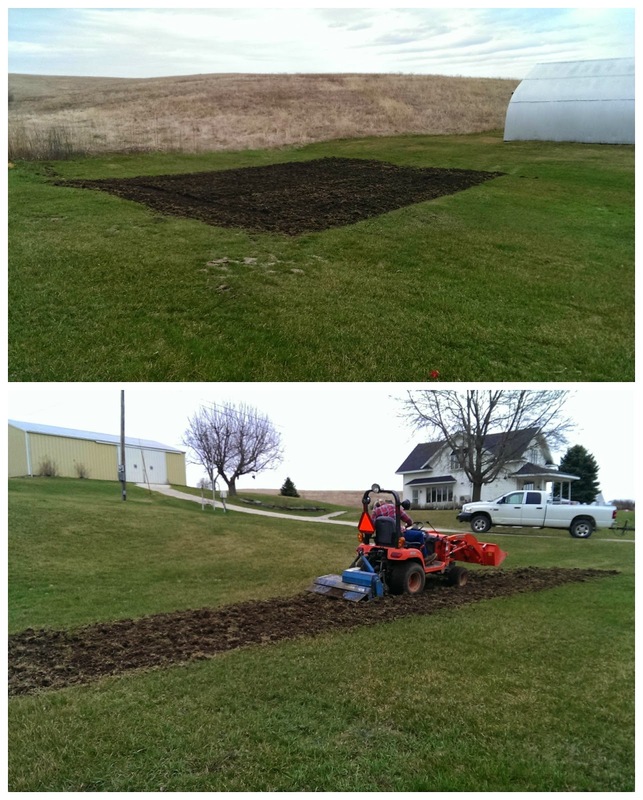 Before we could plant, we needed to hand-till, rake, and create our mounds. Did you know that squash is usually planted in mounds? While I worked my way down the garden raking out the rocks and grass, Kate made mounds for our seeds. After we planted the seeds, we used black plastic to create a weed barrier. Because we want to avoid chemicals and pesticides, Kate also brought leaves she'd saved to deter weed growth. We spread the leaves between and around the mounds. That was enough for yesterday. This morning Kate showed up with doughnuts for breakfast (yum) and we tackled the larger main garden beside the house. The grass and weeds had begun to take over this poor garden, too. Since this garden is considerably larger, I decided a tiller would help us out tremendously. Thank goodness for our awesome neighbors who not only let us use their tiller, but helped us load it up and unload it from the pickup. That thing is HEAVY! You can see the difference it made in the photo above. After we cleaned up the rows of corn Kate had planted a couple of weeks ago, we were excited to see it popping up! Seeing our baby corn spring up gave me hope that all of this hard work may just pay off! And now... we patiently weed, water, and wait. We have room for a few more things... what's your garden must-have?! I'd still like to plant a couple of tomato plants and maybe a blueberry bush!